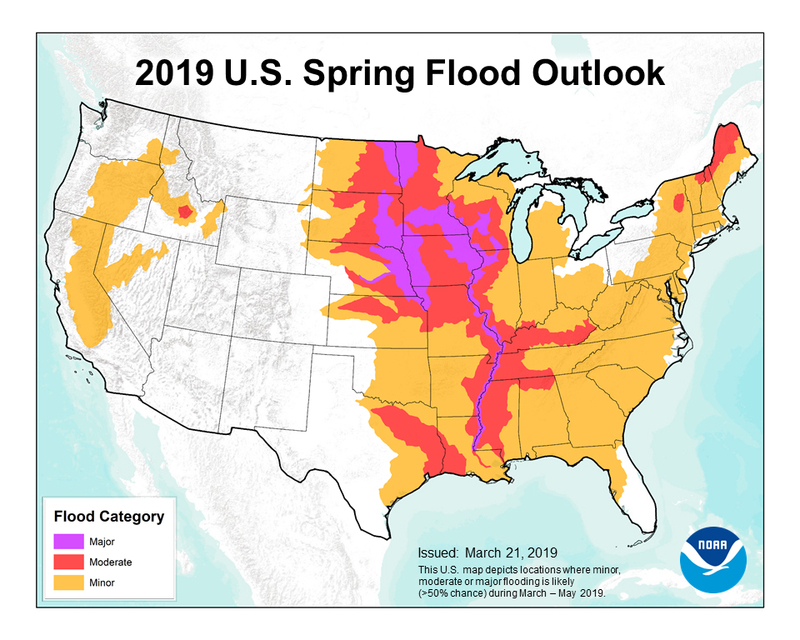 The National Oceanic and Atmospheric Administration’s Spring Outlook warns that two-thirds of the U.S., including Indiana, faces an elevated risk for flooding due to above-normal precipitation. That precipitation is one of several weather changes projected to increase due to climate change. The NOAA says early snowmelts and heavy spring rains have occurred where soil moisture is already high. The upper Mississippi and Red River of the North basins have already received rain and snow up to 200 percent above normal, resulting in deadly flooding in several Midwestern states. 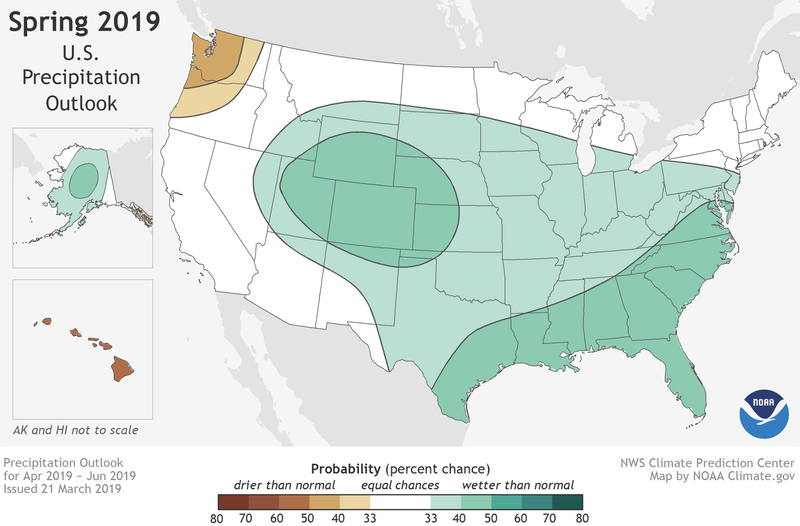 NOAA is forecasting an elevated chance of risk for more than two-thirds of the country until May. In Indiana, the projected risk is not as severe as those faced further west, but could be life-changing for some. Areas surrounding the lower Ohio River are at risk for moderate flooding. Parts of southwestern Indiana bordering the river have a more than 50 percent chance of facing moderate flooding this spring. Most of the rest of the state has a higher than 50 percent chance of seeing minor flooding. NOAA predicts Indiana and many other parts of the country will have more precipitation than usual. But is this year’s increased risk of flooding a natural phenomenon, or is the weather a symptom of a changing climate? NOAA scientists are reluctant to make that call. As soon as weather events do happen, data are collected and added to the decades’ worth of information collected by weather-watching agencies like the National Weather Service. The NWS says scientists there look at 30 years of data at a time and see how precipitation and temperature have changed over the decades. Through that documentation, scientists are able to determine whether and how the climate is changing. They use that knowledge to help guide their weather projections and forecasts. A federal study used that type of data gathered from around the world to determine how the changing climate will affect people’s daily lives. The 300 researchers from 13 federal agencies, including the Department of Defense, NASA, and the U.S. Environmental Protection Agency, authored the National Climate Assessment. The study found that climate in the U.S. is indeed changing, and that change is primarily due to human activities like the burning of fossil fuels. Researchers found the average temperature in the U.S. has increased by at least 1.3 degrees Fahrenheit since record keeping began in 1895. Most of the country has also seen an increase in rainfall since the 1950s. Closer to home, researchers at the Purdue Climate Change Research Center have used local data to determine the impact of climate change on Indiana. They have compiled several reports detailing how climate change will affect Hoosier health, forest ecosystems, agriculture, tourism and several other factors. One of the reports tracks how different aspects of the weather will change in the next century. Researchers found that Indiana’s annual average temperature is projected to increase by up to 3 degrees Fahrenheit by the mid 2020s, and up to 6 degrees Fahrenheit by midcentury. The temperature difference will add stress on the state’s most historically popular crops, corns and soybeans, and could reduce crop yields. The report also found that in the last 100 years, rainfall has increased by about 15 percent, or 5.6 inches. The area forecasted to fall under moderate flood risk this spring has seen an even more dramatic rain increase. The annual average precipitation in counties bordering the Ohio River has increased by 6.9 inches over the last century. Precipitation in the counties bordering the Ohio River have increased by as much as 6.9 inches a year. 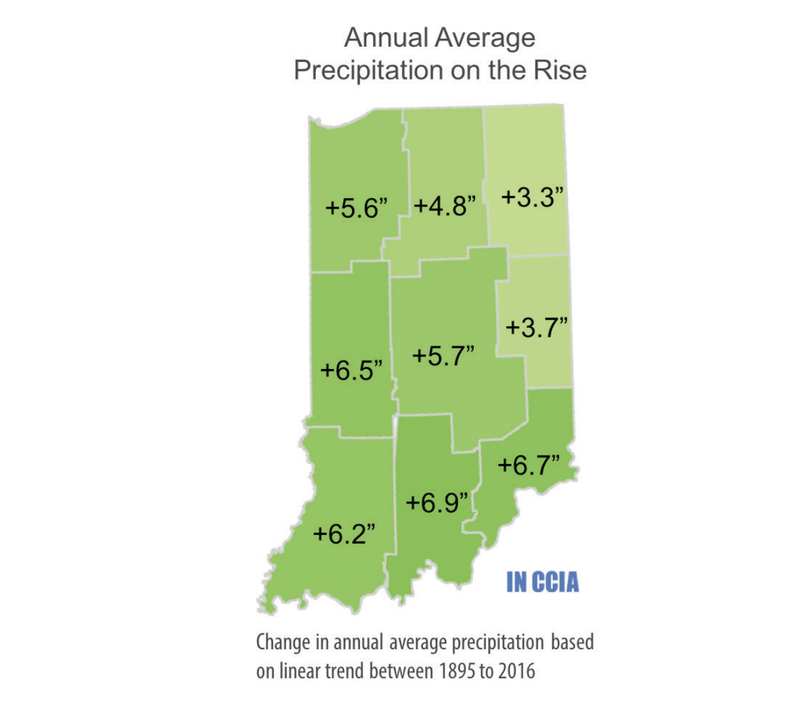 The increase in precipitation in Indiana has been seen mostly in winter and spring. That observation mirrors what meteorologists have seen happen across the U.S. in 2019. Indiana has received nine federal disaster declarations impacting 82 of the state’s 92 counties. Last May, melting snow and heavy rain caused extensive flooding in northwestern Indiana and along the Ohio River. IDHS noted that some parts of the state had up to 7 inches of precipitation above normal in February. In its 2019 Standard Multi-Hazard Mitigation Plan, IDHS recognizes the changes in precipitation brought about by climate change, but says the state may face difficulties coping with the changes. “Increased precipitation will create challenges for flood control and storm water management,” the report says. Indiana’s Department of Homeland Security also told the Indiana Environmental Reporter that it has employees who remain in daily contact with public safety officials in each county and district during weather events. The NOAA says two-thirds of the United States faces an elevated risk of flooding. Most of Indiana is predicted to have above average precipitation and more than 50 percent chance for minor flooding. Parts of Indiana along the Ohio River could face moderate flooding.